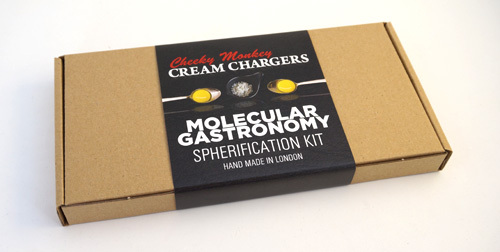 This molecular gastronomy kit (spherification) is a great introduction to the world of molecular gastronomy. All of the equipment, molecular ingredients and recipes are included so they’re really easy and straightforward to use. These kits focus on the modernist cuisine technique that is known as “spherification”; which essentially means making edible, liquid filled balls. These can be small pearls or caviar or larger spheres or bubbles. 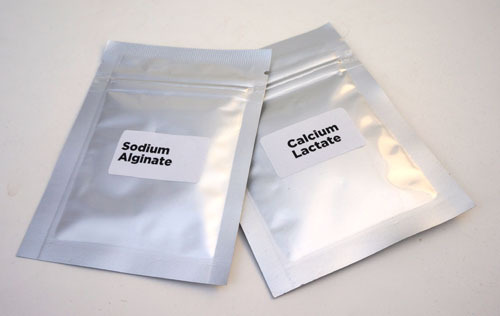 The two styles use the same molecular ingredients calcium lactate and sodium alginate but different techniques. 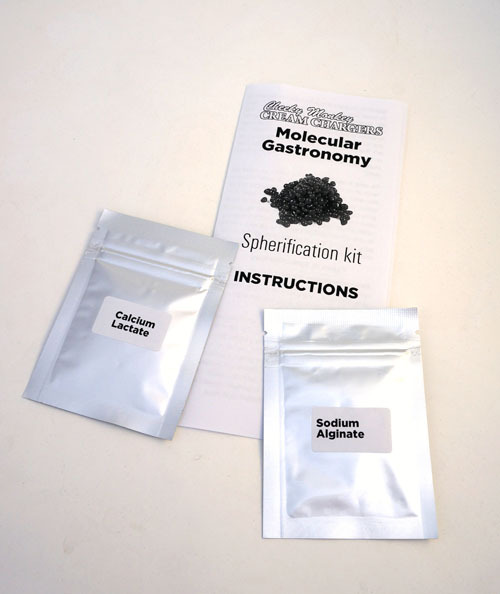 The molecular spherification kit has two recipes one for each style of spherification – so you can try each method out. We like to think that molecular gastronomy kits are just the beginning of a culinary odyssey so expect to be developing your own recipes based upon the methods included with the kit. These are very competitively priced compared to other brands of gastronomy kits so make ideal gifts for anyone you know with a gastronomic persuasion. These kits have been tried out with children who really love the magical science aspect of them and like to come up with their own recipe ideas. The ingredients are all vegetarian and may sound a bit “chemical” but are all perfectly safe and used in the food industry. They are derived from plants such as seaweed. If you want to see examples of the recipes and be inspired then take a look for spherification or reverse spherification methods. You do not need to be limited to food either – there are some great recipes for reverse spherification cocktails such as Molecular Mojito Bubbles. The limit to what you spherize is only really limited by your imagination. 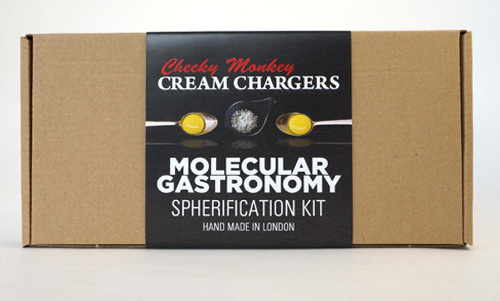 The sperhification is the first of a range of molecular gastronomy kits that we hope be launching soon. Please send us any great recipes that you develop or photographs of your culinary creations. This is very much just a stater molecular gastronomy kit for beginners, however we're sure that once you've tried it out you'll be wanting to expand your modernist cooking repertoire so perhaps you'll be wanting to try out some of the larger kits we stock – all made by the brilliant Canadian company Molecule-r or perhaps get yourself a molecular gastronomy cookbook for some true inspiration! Modernist Cuisine, the daddy of them all. You are unlikely to be able to afford the book (although it does have wipe-clean pages) but the site has enough of the images that you can drool over for free. It does also have a selection of recipes. MolecularRecipes, as the name suggests this has a lot of recipes, and unlike other sites they really have actually tried out the recipes themselves. They reference a lot of the cookbooks you can buy so it's a good place to find which molecular gastronomy cookbook you might find to your tastes. They also have one of the best sections outlining the different modernist techniques. With good clear instructions. Molecular Gastronomy Network, this site has a fairly inactive forum – but it's additives section is a good place to get an outline of the various chemical ingredients that you'll be using. Khymos, this is the one site that rules them all with the unbeatable free resource. Don't be put off by the mundane title – just download it and have a read. It's got heaps of recipes and possibly the best, most scientific description of the ingredients. Hydrocolloid Recipe Collection – this resource has been better researched than many of the cookbooks that will cost you real money. The only thing it lacks is the glitzy colour photography of most cookbooks. Modernist Cooking Made Easy, a good general resource for molecular gastronomy information with some well priced books available. They're not large flashy coloured things like those produced by molecule-r but they are much cheaper and still good value. All of the above sites have a recipe sections, and other places you can look for recipes are Taste Spotting, How to Cook That and Epicurean. To get yourself an overview this site has nicely written and brief summaries of molecular gastronomy Physics.org. If you have the time and the brain or it then a paper written by Herve This carries LOTS of info – but it is not exactly light reading... If you want to see the best at the top of their games – then there some videos by the best Molecular Gastronomy Chefs in the world linked to on Enthusio, they are not exactly recipes that you are likely to follow but all the videos are a visual treat, and remember the first taste is with the eyes! I hope that is enough to keep you going, now pop that molecular gastronomy kit into your shopping basket and let us know how your experimentation goes.